I've put together and posted another Ethiopic reading guide, this one for the first five chapters of 1 Enoch. The first six pages include a transcription of Charles' Ethiopic text with plenty of space between lines and a large margin for taking notes. 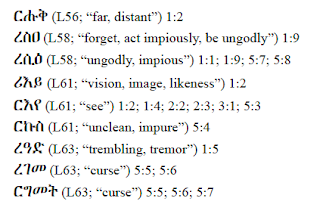 The remaining pages have an alphabetical vocabulary list with English glosses, a list of verses where the words occur in these chapters, and a page number for the entry in Leslau's concise lexicon. 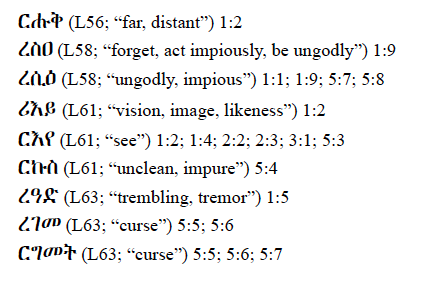 1 Enoch 1-5 is an interesting unit of the text that serves as an introduction to the Book of the Watchers and the corpus as a whole. Lots of theophany language -- if you've ever wanted to know how to talk about mountains melting and shaking in Ge'ez, this is the text for you. You can also download two other Ethiopic reading guides for the Book of Jubilees on my Academia.edu page.